and tucked securely around my bed. directly buzzing in their ear! both keeps them out and keeps them in. I knew if I tried hard enough that I could find my picture of the mosquito–netted bed in my treehouse! Finally found it in my Facebook photos. This entry was posted in humorous poem, Insects, insects in Mexico, insects of mexico, Judy Dykstra-Brown, La Manzanilla and tagged insects, insects of Mexico, mosquito netting, mosquitos, poem about mosquitos on March 6, 2016 by lifelessons. Love it. Light-hearted poem, with a humorous ending, and great scansion. Thanks, Dreamer. 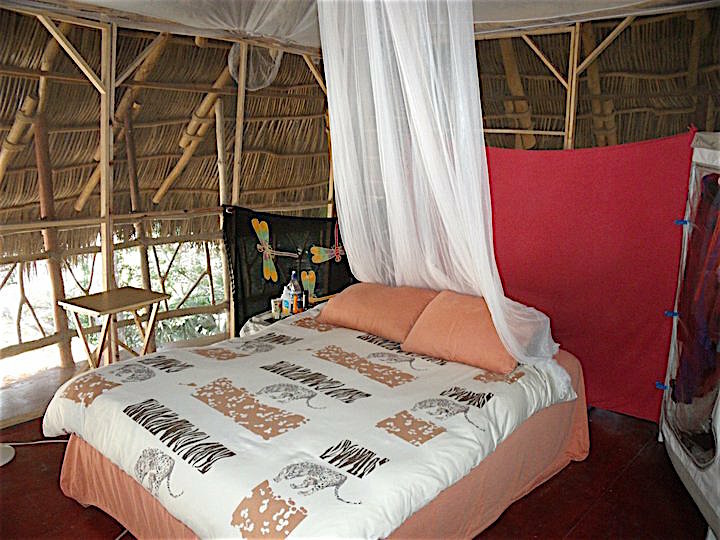 I’ve been trying to find a picture of the bed and mosquito netting in a treehouse I rented five years ago, but fear it is on a backdrive back home! So the posed shot was as good as I could do. Luckily no mosquitos this year. Dengue and a new mosquito-related disease has caused them to have an aggressive mosquito-fighting program. 🙂 You’re welcome! You like a somewhat alarming (albeit adventurous and colorful) life what with dengue and zika rampaging through the south. Hope you stay safe. Thanks! Couldn’t remember the name for Zika. Sadly, affects pregnant women and fetuses. Insidious. I found out they were hiding out in my closet during the day and coming alive by day. Yes. Tricky and duplicitous. They will get you in the rear if it is against the netting! 🙂 Can you smile at any poem about mosquitoes? But I did! Just came home because I was feeling like a picnic for mosquitos..First time I’ve felt them since I’ve been here. I got so nostalgic seeing the photo of my bed with mosquito net in the tree house that I went to see about renting it again next year and extending my stay by a month. Two months by the ocean and one in the treehouse. I’ve been known to nearly knock myself silly trying to get the skeeter to go away. Tree house. What a great place, ‘cept for the bugs.